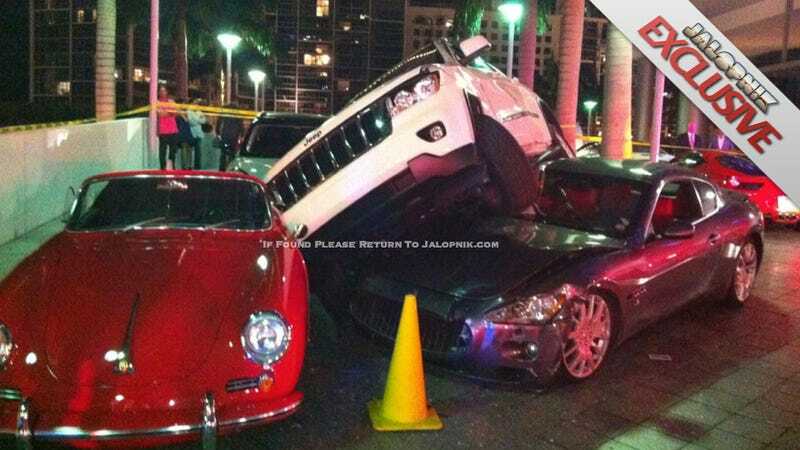 We just received this photo of a Jeep Grand Cherokee, apparently driven by a valet, that managed to vault itself over a Mini and into a Maserati GranTurismo and a vintage Porsche 356 just minutes ago. No one was hurt, but there could be damage to $400,000 worth of cars depending on the specifics of the Porsche. This photo comes courtesy of Michael, who says it happened outside the Epic Hotel near Downtown Miami Florida. Whatever event was going on, there were a number of high-priced cars gathered around the entrance when the driver of this Jeep Grand Cherokee lost control and crashed into the cars seen here. Visible are the Jeep Grand Cherokee (~$30,000), a Maserati GranTurismo S (~$120,000), a Mini Cooper Countryman S (~$28,000) and of course that Porsche. If those are bucket seats in the photos and this is a real Speedster, it could be worth as much as $200,000. Anyone there and know the details of what happened? UPDATE 1: There's now video of the aftermath and it seems to point to a valet as the culprit, not a drunk driver as originally reported. We're also hearing a Bentley may have been involved. Of course, it's possible it was a drunk-driving valet! UPDATE 2: Courtesy of Jorge, two more photos of the image. Apparently the person who wrecked the vehicles was there an hour after the crash, but no one seems to have details on who the person is. UPDATE 3: The local news catches up four hours later with an on-the-scene report. According to them, the Maserati "was coming down a parking garage ramp too fast, lost control, and drove his luxury sports car right under the SUV." How fast must it have been going? Also, we now think the car was a Cabriolet. No word on whether or not it's original.